Sponsored/Disclaimer: Several weeks ago, I received a PR package from Pixi Beauty. Pixi Beauty collaborated with four beauty enthusiasts: Aspyn Ovard, Caroline Hirons, It's Judy Time and Maryam Maquillage. I've tried all of the products and will be reviewing each this week. I received these products for free, but as always I promise to give my readers my 100% honest opinion for each product. Maryam Maquillage collaborated with Pixi on a Strobe & Sculpt palette, Strobe & Sculpt Brush and a Strobe & Bronze palette. I can only imagine how challenging this collaboration must've been! Contouring and Bronzing shades are very difficult to put together. Below are my thoughts on each! Add light! Add shade to your face! That's what strobe & sculpt (contour) means! Let's first talk about the sculpting part. You're given three (3) brown shades! They're very WARM TONED! I'm african-american. I'm fair with yellow undertones. I've tried these several times and their effect is very MUDDY on me. Even using a light hand (brush), they're very pigmented. I didn't particularly care for their effect on MY skin. So I can't imagine these on lighter skin tones. Darker skin tones, maybe...depending on your hue. The next issue is 'baby chick'. It's a light yellow, that is suppose to be used under the eyes (baking). It emphasized the fine lines under my eyes. It didn't look good. The winners are the two strobe colors, 'caviar dreams' and 'honey bunny'. They're two beautiful shades that add light & color and also compliment all skin tones. 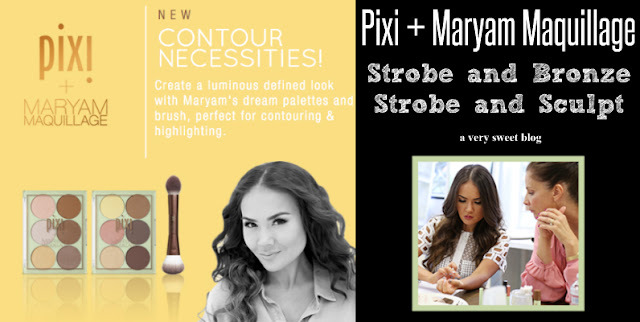 The Pixi x Maryam Maquillage Strobe & Sculpt Brush is sold separately. It is absolutely DREAMY! The larger end is what you use to apply contour shades. The smaller end is what you use to apply strobing shades. The bristles are very soft and PERFECTLY SHAPED to apply each. It feels so good on the face and I will definitely use it to apply my contour and powder highlighters. I plan on buying one! It's that good! This palette is all about bronzing and adding light (strobe) to your face! This palette has two (2) brown matte shades; one (1) brown sparkly shade and three (3) strobe/highlighter shades. Again, the browns are very warm in tone. They came off muddy on me (even with a light hand). The strobe/highlighter shades were very pretty, but keep in mind that the color payoff is very light (like fairy dust). Final Thoughts: Personally, I would've made a strobe/highlighter palette and then a separate contour/bronze palette. Applying these, I constantly went back & forth to each palette. Usually you bronze & sculpt and then apply highlighters last in makeup application. That way, you have all the darker colors in one palette and the lighter shimmering ones in another. But that's just me and I am no makeup expert. LOL I love contouring, but I don't like it when the brown doesn't fit my skintone. No one would! I definitely don't blame Maryam! There are SO MANY skin tones out there! Even the best of beauty companies get it wrong. Some contour palettes don't work for me. It's a matter of finding what brand/palette will work for you. This is the last of the Pixi collaboration reviews! I hope you guys enjoyed and found them helpful. Have a great weekend and I'll be back with more reviews Monday! The shades look lovely Kim so it's such a shame they didn't work for you! A few times I've tried to buy makeup and found they don't have the shade for my pasty skin so I know there isn't always something for everyone! Bronzing and contouring shades are tough. It took years for me to find a bronzer that didn't make me look muddy - Laguna by Nars - and since then, I've rarely tried anything else because so many shades just don't work. It's a shame that these ones fall into that category but sadly, it doesn't surprise me; very few brands get these products right. I love the look of the highlighters, though, and I think it's a shame you can get them all in one palette. I am not much into strobing, highlighting and all the jazz and warm bronzers look way too orange on my skin, but as you said, there are so many skintones, you cant do a palette that pleases everyone. I have yellow undertones and usually I actually do prefer warmer contours so I'm so curious how these would look on me or if'I'd feel the same as you. Out of all the collections I'm most drawn to the eyeshadow palette followed by highlight. You know I am super basic so strobing is not in my top ten ! However if I were to give it a try i'd probably fail with these products... what can I say, at least the brush worked ? After reading your complete review, it really would've made way more sense if they created a strobe/highlighter palette and a separate contour/bronze palette like you suggested. I can only imagine how tedious it would be to go back and forth between two palettes like that. That brush sounds marvelous though Kim! How unfortunate that the colors weren't suitable. Women are in every shade and the selection should have been larger. The brush does look fab! Hmm, both palettes are definitely not for me but I'm also on the fence about the dual ended brush. Kim, how do you store your dual ended brush? Just lay them down? I find it to be so inconvenient to store them laying down so any tips would help. Sorry that these didn't work for you but I appreciate the honesty! The second palette might work a little better for me. The brush looks really nice! Sorry you couldn't find a color to suit you! I have trouble with contour shades too. Bronzers are usually easier for me since I try go use them lightly. To be honest, I'm a bit over contouring right now. If you already have an angular face, then you don't need a ton of contour. That brush sounds really nice, though. I haven't noticed any brushes from Pixie before, but I'll have to check them out! The brush looks super nice! That's too had all of the bronzers and contours didn't work out Kim! A lot of shades look muddy on me too. I'm super picky on bronzers and contour shades. All of the highlighters look pretty! I agree that they should have made a palette for the highlighters and a palette for the bronzers and contour shades lol! I've heard so many good things about pixie products but I've yet to try them! these colors are so pretty and thanks for doing the swatches! I love and look forward to your reviews Kim. Very honest. Too bad about the palettes. I was never hot and heavy on strobbing. Loving the brushes though. I've still never been able to get my hands on any pixi yet, I think I'll give these palettes a miss after your review but the brush sounds amazing! I hate it when dark shades look muddy on me, I definitely need cool toned bronzers. The shades look great, what a shame they don't work for yellow undertones like us! What a helpful review, thank you for posting this! Sorry to hear these were on overall not a good match for your skin tone. Pixi x Mariam Maquillage: Strobe & Sculpt Palette seemed promising, too bad that the shades meant for strobbing are so dark....at least there are those two lovely shades (caviar dreams and honey bunny) that you can see use. The other palette Strobe & Bronze one, seems nice too...but again the shades were not a good match? You're right though, there are many skin tones out there and it is hard for the companies to get them all right. Both palettes look very pretty and the strobing shades are beautiful but while I've yet to try Pixie, I'm more interested in their skincare. That dual ended brush looks good though. Kim, you are just the sweetest. I love how you went about sharing your thoughts on the collection in a way that was constructive and understanding. You're right, there are so many different skin tones, it can be hard to get it all right the first time around, especially when it comes to bronzers! That said, I'm sorry the ones included in the palette didn't work for you, but at least the those strobing ones did, they're so pretty and I also love the brush! Thanks for sharing and I hope you have the best week ahead, beauty! It's a shame that this palette of contouring and strobing did not work enough for you Kim, I'm in the middle of summer and this season I'm a light makeup, but as always I like to read an honest opinion! Kisses. The colours look very similar Kim. I personally love anything brownish, so I probably like this. Lol. And it's nice that you like the brush! I'm still using the one you gave me. Love it! I will enjoy to learn how to do contouring, that will be fun. The shades here are so nice. I know Pixi, the pigments are deep. Products are well made.